on 10 through 80 meters with use of a tuner . It is easy to describe and build. with gain and does well horizontal at 10 feet above earth as an NVIS antenna . If 92 feet of wire is used instead of 67 ,it can even cover 160 meters and all bands to 10 meters. I use a version of this and often call it my End Fed Half wave...67 feet of wire and a 17 foot 6 inch wire attached to a 4 to one balun for 6 through 80 meters, or 35 and 17'6" for 6 through 40 meters...it is easy and effective and you can carry it in a pocket. Does the orientation of the 67 foot wire section matter? e.g. If the ladder line portion is running vertically up the side of my house, could the single wire part lay across my roof? Also, can that 67' portion be angled or must it be in a straight continuous section to resonate properly? Glad you asked that. Straight lines are easier to draw. The ladder line should be kept at least a foot from the earth and at least a foot from metal objects. The wire 67 foot or 85 foot can be horizontal,part (or all) vertical, bent but not passed back within 3 feet of itself. Pretty much keep from 'clotheslining people' and it will work ,If run mostly at or about 10 feet you gain NVIS local coverage while retaining good distance capability. Building,trees,metal objects near the antenna ALL effect it , but it is NOT a tuned length and the tuner makes adjustment while the antenna does a good job at getting your RF on it's way. 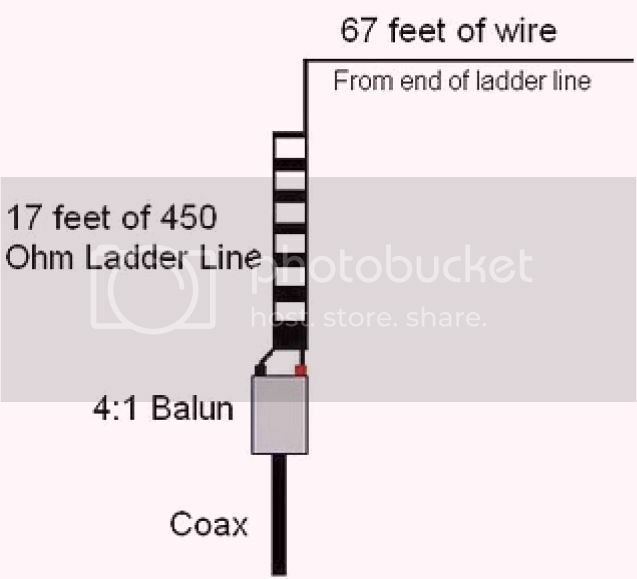 Also note that the ladder line is to get your signal to the antenna ( and perform matching )and when used portable all you need is the lengths of wire (total of 85 and 17 foot)and a 4 to 1 balun plus the all important TUNER. Is there any RF returning on the outside of the coax shield? It's common for Windoms to do that from the balun to the rig, it's a property of unbalance. Many people add ferrite chokes and such at shack entry / grounding points to prevent this. I see some similarities between this design and a Windom, balance-wise. Sad thing is most people forget to use an S meter in the shack after a new antenna install to see if they are bathing themselves in RF while keying. There can be some RF though the balun and a not mentioned common mode choke will knock it out. a 20 foot or so length of coax in a coil about 6 in diameter or so near the balun. Antennas radiate and so they all expose you to some RF,though this antenna ,being NOT a half wave on any current band tends to avoid the exposure within the operating area. This antenna was designed in the 30's and called ZEP because of early use on airships...or so I have read. A proper dipole for each band is hard to do,but one of the best ways to do it. This is just an easy compromise that works well for many who have tried it. I have used one portable ,because it is easy to toss it in a tree and be on the air. I don't yet know of a perfect antenna...but I am looking. TG and anyone interested ,here is an interesting series to read about antennas ,SWR,and we can all gain something from it. This is great information Carl! Is their one balun brand you prefer over another? I use MFJ or Jetstream...here are some links (Price and power decide) also watch for the FREQUENCY as most are not good to 6 meters ,which is important if 6 meters is a band you want...Below are two I have in use now. Thanks for another informative post, Carl! I'm beginning to think that this would be a cheap and relatively easy to install option for my QTH. It would be a fair bit of work and coordinating with my landlord to install any full length dipole (will eventually happen) and the challenges of ensuring enough space for the 34 feet of balanced line for the G5RV to hang away from metal siding, etc. will pose challenges. It will probably be an Alpha-Delta DX-CC that I'll put up on the roof come March. But back to the point of this thread, It would appear as though I could get the balun, ladder line and over 90ft of wire for well under the cost of MFJ's 80m end fed zep, and it would be relatively easy to string the wire around the yard, whether for NVIS or set higher. I have a spot that would conveniently allow for mounting the ladder line at 17ft, and only slightly angled away from some aluminum siding should be easy enough to do. If I wanted to set the wire low (at approx. 10ft to provide NVIS and not decapitate anyone in the yard) would it be okay to have the ladder line hang at an angle from the contact with wire to the balun? The ladder line is a matching stub and should be kept reasonably stable as it can vary tuning a bit when moving in the wind. I would try for the 92 feet of wire to insure 80 meters is tunable...or prepare to add a bit if 67 feet does not tune well at your location. My version had the balun/coax feed point just a couple feet above the ground and the wire/ladder line were at 20 feet,supported 3 feet off the tower at top and bottom...from there the 67 feet of wire sloped to an 8 foot tall PVC stuck in my metal fence. It worked very well,but had local electrical noise as I have power and cable TV lines on 3 sides of my yard. It is easy and the parts will make many other antennas as you experiment. Regarding "ladder line", is there a common name that non-hams use? When I call local shops asking, they claim they've never heard of it. There are several 450ohm ladder line based antennas I want to try out, so I figure buying a good length of it would be worth my time and education. Ladder Line is what it is: 300 or 450 Ohm...no resistance involved...either size works. TV TWIN LEAD also works ,but just the kind with two conductors and not the shielded type...but TV antennas and twin lead are pretty much relics now. Some shops may call it "Window Line" but it's been years since I heard it called that. So if I understand correctly, we're talking about two slightly different antennas (not counting the different lengths for 40, 18 and 160m. The first is essentially an end fed zep with 67ft of wire attached by 17ft of 450ohm ladder line to a 4:1 balun, plus coax to the shack, and by lengthening it to 92ft can make it suitable for 160m and probably tune better on 80m than the 67 foot version. You then speak of a more portable antenna, which consists of a balun, wire, plus 17.5 ft of wire attached to the balun, I presume to act as counterpoise? If I were to first try this latter design (I could pick the required parts up tomorrow, but actually have to order the ladder line around here as my local ham outlet only has 300ohm line at $60 for 100 feet! ), would I need another length for the counterpoise if I'm matching it to 92 feet of wire for 160/80m? And since I have both an LDG auto-tuner for my 987D, but also an MFJ 949E manual tuner available, might the latter be more suitable for tuning an end fed wire? Any recommendations for which balun to use? The first is primarily meant for twin lead, but would I be able to use if for the simpler two wire design, at least until I get some twin lead? The second balun looks appealing since it's rated to 1000w, which might make it useful if I eventually get a 500w amplifier down the road, while the third, an MFJ product indicates that it's a current balun, which I noticed from the other links that you've posted might be significant. If I just add a few plastic or ceramic insulators and zig-zag the antenna across the yard, probably a bit under 10ft to start, I could set up and take it down without waiting for access to the upstairs balcony/roof, etc. and do NVIS right away. I'd basically try to keep the wire/balun at least three feet away from any metal, and make sure that none of my bends are at less than 90% to ensure that the wire does not interfere with itself. Later, if I add the ladder line and try to get the antenna higher, would it make a big difference if different sections have to be at different heights? I'd currently have it at about 17ft high from the ladder line end and could string about 50ft of the wire across to a tree at about 20 plus to maybe 30 feet, but it will need to be supported at a lower height for some distance after that and at the final endpoint, probably back to 17 feet. All of the other antenna options that I've discussed on other threads remain dependent upon factors that might take months to work out, so I'm really interested in figuring out if this might offer the fastest solution to my 80m woes. If I have to settle for NVIS for now and can later get the wire high enough for longer distance comms if circumstances warrant, this would fill the biggest gap in my ham capabilities up to the present time. Even if I end up eventually putting a full length or shortened 80m and up dipole on our roof, I can see this remaining useful both at home (where I'd still like the option of operating NVIS) and as a portable device. And aside from the parts listed above, I presume that I'd need to solder the wire to the balun (elementary question I know, but it sounds like it's about time I get a solder gun). If I get the ladder line later, I'd then just solder the end of the 92ft length of wire to one wire from the ladder line. Every part of this antenna can be used in many different forms,like legos, there is no end to what can be done .Here is some reading about SWR and antennas that answers many questions .Just read each page and link to the next as antennas and SWR become much less a mystery. OH just in case ...BUILD the wire only version and get it on the air. We might make some changes later if you have band tuning issues..The manual tune may have a bit more range than the auto tuner but I think the LDG will do well for you as it does for me. Plus...if tuning or stability is noticed ,a second 17 foot or so counterpoise or maybe an earth ground may be the fix. I had a bit of RF in my shack until I used an earth ground. So I'll plan on picking up 125ft of stranded copper wire ($30 Cdn) and a W4:1 balun ($35) and perhaps another two or three ceramic insulators (I've got at least two here at home). The precise height and pattern will invariably be a trial and error process, and will probably be adjusted whenever I might get the ladder line. I'll may start very low but might go higher it it's easier to keep clear of any metal objects or branches that way. I noticed in the notes above that you speak of a 92foot wire for 160/8m and higher frequencies at one point, but then speak of 85ft and the 17ft counterpoise elsewhere for 80m use (which interestingly enough totals the overall length of a G5RV). Since it's easier to start long and trim back, perhaps I'll try to cut 17.5 feet for the counterpoise and start with the 117-118feet that would be remaining, unless you'd think that it might be better to cut it closer to 92 feet (plus 1-2 feet for fudge factor) right from the start. I realize that the articles that you link to suggest that I not fret too much about getting close to half wavelength on my preferred band, but if I'm focusing on 80m, would there be any cons to going all out and laying a 133 ft. wire plus 17 ft counterpoise (from a 150ft roll) if it can be fit into my space? If I later decide to shorten the long wire to 92 or 85 feet I could always use the extra wire to make a second 17ft counterpoise. Though I'll probably experiment with it both ways, should I expect that having another dipole cross the yard at a slightly higher height to interfere with the long wire? Since the main point of this experiment is to get on 80m, I'd happily rely upon the dipole for higher bands and switch to the wire for when I want to work 80m and NVIS. Another quick point: since the ONTARS 80m nets operate almost every hour daily from 7am to 5pm, that would offer lots of opportunity to check the antenna's TX and RX, as well as the effect of various adjustments to length, operating height, etc. I could easily do that in between other activities around the QTH and wouldn't be adverse to trying it on some local 40m nets or even ongoing 20m continental nets like those found at 14.300Mhz. And I'll naturally test it across all of the available bands from 160-10m to see which bands the tuner can handle. Perhaps I'll even take down the dipole for a week or so to play around with this setup at various times and frequencies. I'm getting stoked at the idea of being able to play around with this until the opportunity arrives to install something on the roof! Quick addendum: I see now why 84-85 feet and 17 foot counterpoise was chosen, as well as the longer lengths that help versus which ones to avoid: http://udel.edu/~mm/ham/randomWire/. It's a case of trying to avoid multiples of half wavelengths which are harder for the tuner to match. There's lots of articles about the length combination above from 1936 to present, and a chart at the link above indicating which other lengths might work best for particular bands. YEP,Random is not so random. And while I arrived at the 17 foot counterpoise during experiments with tripod mounted mobile whips for HF work (Hamstick from MFJ) I settled on 17' 6" and use a 20 meter dipole in my portable kit as the verticals counterpoise and it allows few items in a small kit to provide many antenna configurations. I rarely need to go portable now,but do advise those who do on the importance of antenna kit components. The initial results are in! This antenna design looks very promising, despite a few kinks that I still need to work out. Many thanks to Carl for all of the information and links that he posted, that were invaluable. The basic design of this antenna was first mentioned in a 1936 article in QST, where the author spoke of an antenna put together by his friend W3EDP, who used an 84 foot wire and 17 foot "counterpoise." A variation on this design is the antenna posted by Carl at the top of this thread, which gets the same 84 foot main wire by attaching 67 feet to 17 feet of ladder line, with the wire on the ladder line that's not attached to the main line playing the same role as the 17 foot "counterpoise" in the original W3EDP. Since Carl indicated that the design with ladder line can effectively work 80 and 160m with 92 feet of line, I took that as to mean that 92 plus 17 feet (109 feet total) should be my starting point. I also took note of the following line from another blog post on the subject, which suggested another slightly longer length: "If you are using a longer length of wire, perhaps as a Sloper or inverted ‘L’ good lengths to choose are either 19.4, 22.8 or 34.3m long (112.5 feet), as these avoid high impedances on most of the Amateur bands from 160 to 6m." (Source: http://www.g8jnj.net/usingautotuners.htm). Adding another foot to play with, and a further foot to make up for any wire that will be bent back upon the balun or insulators gave me starting lengths of 114 feet for the long wire and 19 feet for the "counterpoise." The fellow who cut my 150 roll of wire seemed to add an extra foot or two for good measure, leaving me with an additional 18 feet, so I could possibly set it up with two "counterpoise" wires that would sit a short distance above the ground. FYI, the shorter wire could also be set up with spacers to ride up on the vertical portion of the antenna just like ladder line and I'll probably do that eventually, but for now I wanted to just get the antenna installed and on the air. And one more point about the antenna length before proceeding further to my initial results. The following link (http://udel.edu/~mm/ham/randomWire/) provides some further information about the ideal lengths for a so called "random wire" antenna, that isn't so random after all. If you look down the page, you'll notice that the author provides a colour coded chart that shows which lengths to avoid if you want to have multiple band capability. If I understand correctly, the lengths are multiples of quarter or half wavelengths that make it difficult to tune to the bands that they match. I set the balun and feed point to the antenna just outside my apartment with the long wire rising vertically (at a bit of an angle) up to the an insulator at the top of a second story balcony at about 17 feet). The short wire extends from the balun just above the ground to an insulator that's attached to a wooden fence. From the balcony, the long wire crosses the yard to another insulator tied off to a tree in the northwest corner at about 20 feet, and from there the wire crosses over a coach house to the northeast corner, where it passes through another insulator tied off to a tree at about 10-12 feet. I first tied the remaining length of wire to a balcony support post that only gave me ten feet in height and passed awfully close to a power line and trees along the edge of the property. After my first attempt at tuning the antenna, I took down the last leg and connected it to a tripod/crappie pole that now has the end point several feet away from the power lines and at somewhere between 17-20 feet high in an open spot in the yard. It didn't change the tuning characteristics, but at least confirmed that any problems tuning on some bands was unrelated to the power line and branches. So far, the antenna tunes nicely onto 40, 20, 15 and 10m. Because it had gotten dark by the time things were set up, I checked into the "Brother's Net" that runs Monday-Saturday evenings from 7-9pm on 7.192Mhz. I had no trouble checking in and was 59 to the NCS in Maryland (about 500 miles away) by the time he got around to my number. 80m was a slightly different story. I've been listening on a few different frequencies, including the daily Great Lakes Emergency and Traffic Net that runs everyday from about 8-9pm EST. So far I'm able to comfortably listen to a net that's usually much harder on the ears to follow, and I wouldn't be surprised if the improvement in Rx has been a full S unit or higher. But when it comes time to tune, I'm not getting anywhere near the under 2:1 SWR that we're after. Looking back to the chart on the link above, it looks as though the antenna with a couple extra feet for fudge factor lands within the coloured zones that occur from about 109-132/33 feet. According to the chart, I should get 40m and higher, but not 80 and 160. There is however a window from 104-109 feet (that also falls within the lengths listed in Carl's first post) within which 80 and 160m should be tunable. Though I'm not too concerned about 160m access and might find an 85 foot long wire easier to deal with, I like the stronger Rx that seems to come with this longer antenna and will probably just tune it down to somewhere between 105-108 feet, or somewhere between 100-103 feet to avoid a zone about 104 feet that I ought to avoid. The chart that I'm referring to was also for the CW portion of the bands in question, so there'll be a bit of shift for SSB that I'm after. Before I trim I'll see if adding the second 18 feet of wire as a "counterpoise" changes anything for the better (if it doesn't work I'll just take it off again) and I'll consider connecting the short wire to the longer one in twin lead fashion after I get things working with the antenna as set up. Like any first time setup of a wire across a backyard, I can envisage better ways to position it and will endeavour to get at least the end point several feet higher, or at least tie it into the second floor balcony. For Sunday morning and early afternoon, I'll also try it on a couple of 40 and 20m nets that I regularly check into to get a better sense of how it compares to the dipole that's currently down. Hey Canadian Prepper...the 17' 6" length was pretty critical when using plain wire (Not ladder line)and I am guessing also 17' would be critical if ladder line were used...That second 18 feet of wire might should be carefully cut back to 17' 4" or 17' 6" ...maybe do the test first at 17' 6" for one or BOTH of your short wires. I had the same problem when developing my BIG STICK VHF/UHF antenna and the radio of the short to long wire is pretty critical. Lets think 85/17 represents a 5 to 1 ratio...I would stick to a 5 to 1 ratio while avoiding the multiple wave zones of the cut chart. Just a though if you start scratching your head with getting the wire to tune multiple bands ....I actually did go through this with my first few versions but don't know for sure if it were my surrounding or the antenna. And it is interesting I worked up to my 17' 6" and 35' for my 20 meter design without being aware of the W3EDP.This is still an experimental antenna for me and I want to see if our results compare. I had a decent first day with the wire antenna. I began with two QSOs to the daily 40m provincial comms net, speaking to a US station during the pre-net and the NCS in Ottawa later on. Afterwards I went to 14.300Mhz and checked into the Intercon net, where I came in strong into North Carolina. The wire seems to have particularly good Rx on that band. I then played around with 15m for two contacts before noon in Ukraine and Belgium, followed by contacts into Slovakia, Northeast Italy and Northern Spain on 10m. The 1pm provincial ARES HF net was a bit disappointing, as there was lots of QRM and it was harder to listen to many of the stations. Another regular check in that's only a few miles away from me said however that I've come in the strongest of the several check that he's heard of me from the past. I then managed one more check in to Vancouver Island on the Sunday Trans Canada 20m net and found it pleasantly easy to listen to the NCS out there. I only briefly made contact with Carl on 20m during the regular Sunday 40/20/10m net at 1300CST. It should be emphasized however that my wire probably averages about 15ft overall height and I'll need a warmer day before I can set everything higher. I added the second "counterpoise" but that didn't make any difference when it came to tuning 80m. As Carl Points out, I'll probably need to slightly shorten the two "counterpoise" wires. Since my long wire is longer than the ones referred to in his original post I'll almost undoubtedly need to trim it back slowly by several feet, and suspect that another 6' to 1foot on the counterpoises might still be okay if the long wire remains over the 100ft mark. @Carl: Did you ever try this design on 80/160 meters with the 92 foot wire you described for working those bands, and if so was that with ladder line or the slightly more portable wire only format? The reason I ask is that I added 92+17feet to get the length for a wire only antenna design, plus a bit extra. I want to keep things the longest possible length to maximize Rx, which seems particularly helpful for the 80m band that I want to get on, rather than trim back to 84-85 feet right away. Might you have any link to anyone/any articles about people who've used this design on 80-160 if you haven't worked the latter with it yourself? I'm just trying to get ideas before I end up cutting more than a few feet. The wire is just expensive enough that I wouldn't want to cut back 20-30ft in one foot increments, lol! I must admit that I'm awfully surprised at how easily the antenna tunes on 40, 20, and 15m. I wouldn't be surprised if the SWR is low enough to use it in those bands without a tuner and would imagine that to be even more doable if it were mounted high and away from any potential interference, which may or may not be affecting my own results. The radio was able to effectively tune the wire on 12m today, so I think that contact with twigs, wind, etc., are having a slight effect on the wire. I only did one test with longer wire and that was a 4 to 1 balun with 170 feet of wire folding across my 55 x 55 foot back yard and a 17' 6" short wire and a 35 foot short wire...all bands tuned but 160 was dead. my experiment was a DOUBLE SIZE antenna of the 85/17' 6" that I had used BEFORE I had heard of W3EDP. It worked But I had no room for it as the neighbors were about to riot. It worked great on 80-60-40-20-17-15-12-10 and refused to tune 6 meters. A lot of tuning issues can be local conductivity of soil.I am still working to find what works best at the BOL ...that's where I was today and only could run 35 watts of the battery at the time. By way of a quick update, I shared my difficulties with tuning 80m on my wire with another HAM at our ARES meeting tonight, who noted that he often had to change his feed line length to avoid tuning problems on that band. So the first thing I did was switch from the 50feet of coax I was using to 25 feet, at which point I was able to tune every band from 160-12 (I didn't bother with 30m, as I'm only using SSB right now). Though no one band tuned quickly, I got the max usable bandwidth with 25ft and noticed a significant improvement in RX on 80m. Since the 25ft coax didn't allow me to keep the transceiver in its regular location and my desire to experiment further, I switched back to the 50ft of coax after winding some 12-15 feet into a circle and taping it up. Whether it was the change in overall feed line length or the roll of wire holding back RF to the shack, I got an almost instant tune on 80m and managed to tune 40, 20, 17 and 15m. Though I lost use of both the very lowest and highest bands with this setup, I'll play around with this current setup for the next several days, and work on getting the wire higher now that I don't see any immediate need to trim it. My first contact on the midnight Trans Canada Pow Wow Net managed a 57-58 report to an NCS in Saskatchewan, so I expect further testing in this configuration or with the wire higher to prove the antenna's effectiveness on 80m. Perhaps I'll look to adding a 10m counterpoise to bring back that band, as Carl had suggested to me, switch to the shorter wire to play on 160, etc. but it looks like I'll have lots of options to play with. I don't gather that it's most desirable to have feed line length dictating the tunability of the wire portion of the antenna, so if anyone has any suggestions about that I'd greatly appreciate it. Might taking one of the counterpoises and repositioning it as a balanced line against the long wire help any with that? what works for now and get a feel for it before a change so that you will know which radiates/receive better. I originally had a common mode choke on the coax right near the feed point, but it was just several turns at less than 6" in diameter. The extra size additional several feet of coax seems to have made all the difference. BTW, I've made several other 80m check ins throughout the morning, and despite my reports getting weaker as the morning progressed, I can consistently get picked up and am clearly readable. I'm really looking forward to my results with tomorrow night's Great Lakes Emergency and Traffic Net, plus seeing what improvements I'll get over the weekend if I get the wire higher. In short, this has opened up far greater connectivity with the local ham community over my previous capabilities. Way better to build and make it work than to BUY and find out it doesn't. Now you have a great understanding of the much maligned SWR and a great antenna. You will be asked what you have done by others ,I am sure. And you can tell them it is a "NEW" design from 75 years ago. By way of a quick update, during the past two weeks I've managed to make regular check ins into the ONTARS net that runs everyday from 7am to 6pm, the nightly Great Lakes and Emergency Traffic Net, and some more distant 80m nets like the weekly TAPRNet that runs Sunday nights, and whose NCS is located in Georgia. The antenna's effectiveness is naturally influenced by time of day and propagation conditions, but I can consistently make contact or hold a QSO in circumstances where that wasn't possible or consistent in the past. As for the ability of the antenna to tune, I've noticed that it remains a bit temperamental in that regard. Several days ago I discovered that several inches of snow covering the coax and the common mode choke would change the bands or frequencies within them where it would tune. That was easily fixed by simply shovelling away the snow. The other night I played around with the feed line length by adding two more loops to the choke with the coax that I'm using (no more length for more loops) but found that rather than improving things on 160 and 80m that I couldn't even tune across the entire 80m band anymore, though it might have improved things on 40, 20, 17 and 15m. I undid the extra loops to go back to the way things were beforehand, as that's most suitable for what I'm using the antenna for at the moment. I probably won't play around with the feed length or choke again until some warmer weather inspires me to raise the wire by several feet. That would undoubtedly help the 15-20m bands for DXing and perhaps enable me to get better long distance transmit and receive on 80m. So this antenna remains a work in progress though it's been wonderful for effectively opening up the 80m band that's so widely used in this area. Since I managed to get Ukraine the first day I used it on 15m, I'm confident that it's not only a fine DXing antenna in its current configuration but that I'll do even better once I've raised it.